G:\DeepFakes\OpenFaceSwap\python\python-3.6.3.amd64\lib\site-packages\h5py\__init__.py:36: FutureWarning: Conversion of the second argument of issubdtype from `float` to `np.floating` is deprecated. In future, it will be treated as `np.float64 == np.dtype(float).type`. Press ‘ENTER’ on the preview window to save and quit. 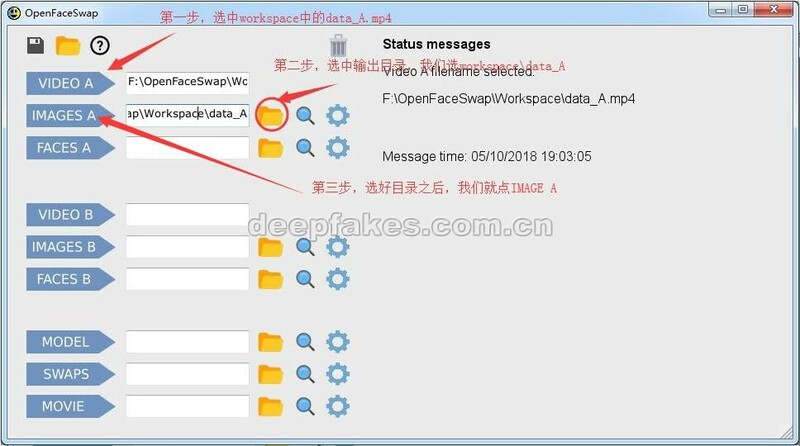 WARNING:tensorflow:From G:\DeepFakes\OpenFaceSwap\python\python-3.6.3.amd64\lib\site-packages\keras\backend\tensorflow_backend.py:1264: calling reduce_prod (from tensorflow.python.ops.math_ops) with keep_dims is deprecated and will be removed in a future version. 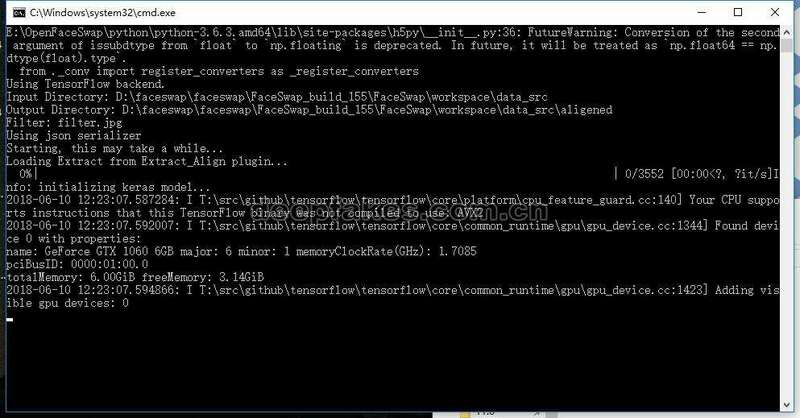 WARNING:tensorflow:From G:\DeepFakes\OpenFaceSwap\python\python-3.6.3.amd64\lib\site-packages\keras\backend\tensorflow_backend.py:1349: calling reduce_mean (from tensorflow.python.ops.math_ops) with keep_dims is deprecated and will be removed in a future version. Failed loading existing training data. nummber of images is lower than batch-size (Note that too few images may lead to bad training). D:\Openfaceswap\python\python-3.6.3.amd64\lib\site-packages\h5py\__init__.py:36: FutureWarning: Conversion of the second argument of issubdtype from `float` to `np.floating` is deprecated. In future, it will be treated as `np.float64 == np.dtype(float).type`. WARNING:tensorflow:From D:\Openfaceswap\python\python-3.6.3.amd64\lib\site-packages\keras\backend\tensorflow_backend.py:1264: calling reduce_prod (from tensorflow.python.ops.math_ops) with keep_dims is deprecated and will be removed in a future version. WARNING:tensorflow:From D:\Openfaceswap\python\python-3.6.3.amd64\lib\site-packages\keras\backend\tensorflow_backend.py:1349: calling reduce_mean (from tensorflow.python.ops.math_ops) with keep_dims is deprecated and will be removed in a future version. G:\MyDownloads\Download\OpenFaceSwap\python\python-3.6.3.amd64\lib\site-packages\h5py\__init__.py:36: FutureWarning: Conversion of the second argument of issubdtype from `float` to `np.floating` is deprecated. In future, it will be treated as `np.float64 == np.dtype(float).type`. F:\OpenFaceSwap\python\python-3.6.3.amd64\lib\site-packages\h5py\__init__.py:36: FutureWarning: Conversion of the second argument of issubdtype from `float` to `np.floating` is deprecated. In future, it will be treated as `np.float64 == np.dtype(float).type`. WARNING:tensorflow:From F:\OpenFaceSwap\python\python-3.6.3.amd64\lib\site-packages\keras\backend\tensorflow_backend.py:1264: calling reduce_prod (from tensorflow.python.ops.math_ops) with keep_dims is deprecated and will be removed in a future version. 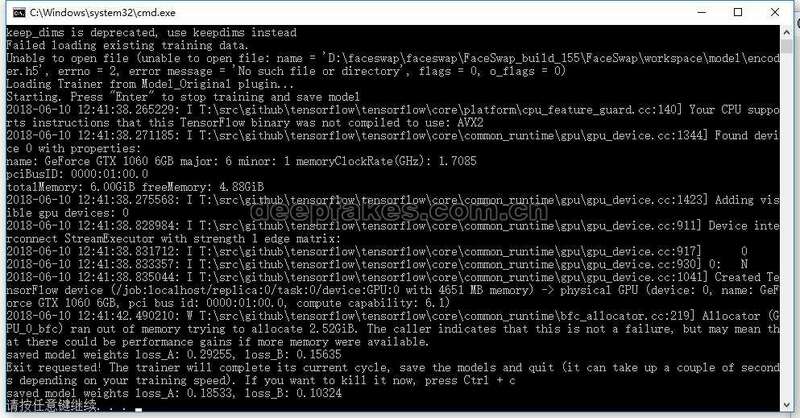 WARNING:tensorflow:From F:\OpenFaceSwap\python\python-3.6.3.amd64\lib\site-packages\keras\backend\tensorflow_backend.py:1349: calling reduce_mean (from tensorflow.python.ops.math_ops) with keep_dims is deprecated and will be removed in a future version. Aligned directory not found. All faces listed in the alignments file will be converted. C:\OpenFaceSwap\python\python-3.6.3.amd64\lib\site-packages\h5py\__init__.py:36: FutureWarning: Conversion of the second argument of issubdtype from `float` to `np.floating` is deprecated. In future, it will be treated as `np.float64 == np.dtype(float).type`. WARNING:tensorflow:From C:\OpenFaceSwap\python\python-3.6.3.amd64\lib\site-packages\keras\backend\tensorflow_backend.py:1264: calling reduce_prod (from tensorflow.python.ops.math_ops) with keep_dims is deprecated and will be removed in a future version. WARNING:tensorflow:From C:\OpenFaceSwap\python\python-3.6.3.amd64\lib\site-packages\keras\backend\tensorflow_backend.py:1349: calling reduce_mean (from tensorflow.python.ops.math_ops) with keep_dims is deprecated and will be removed in a future version. E:\Openfaceswap\python\python-3.6.3.amd64\lib\site-packages\h5py\__init__.py:36: FutureWarning: Conversion of the second argument of issubdtype from `float` to `np.floating` is deprecated. In future, it will be treated as `np.float64 == np.dtype(float).type`. extract Extract the faces from a pictures. 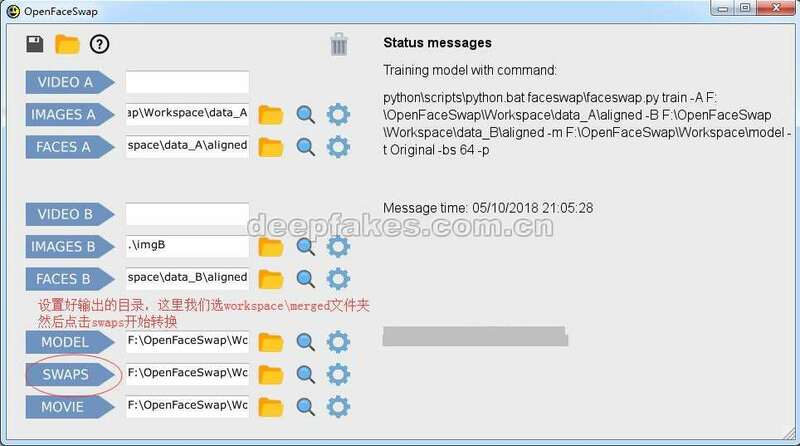 WARNING:tensorflow:From D:\OpenFaceSwap\OpenFaceSwap\python\python-3.6.3.amd64\lib\site-packages\keras\backend\tensorflow_backend.py:1349: calling reduce_mean (from tensorflow.python.ops.math_ops) with keep_dims is deprecated and will be removed in a future version. E:\Program Files\OpenFaceSwap\python\python-3.6.3.amd64\lib\site-packages\h5py\__init__.py:36: FutureWarning: Conversion of the second argument of issubdtype from `float` to `np.floating` is deprecated. In future, it will be treated as `np.float64 == np.dtype(float).type`. 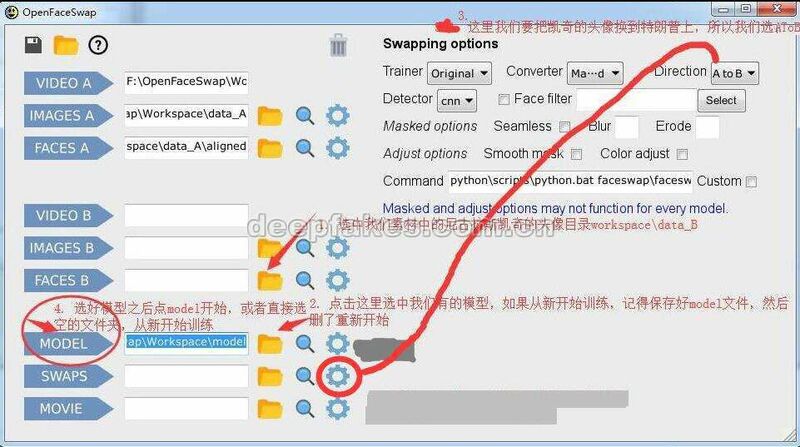 点 swaps , 报错找不到模型 , 我修改了名称为 decoder_A.h5 , 还是一样报错. 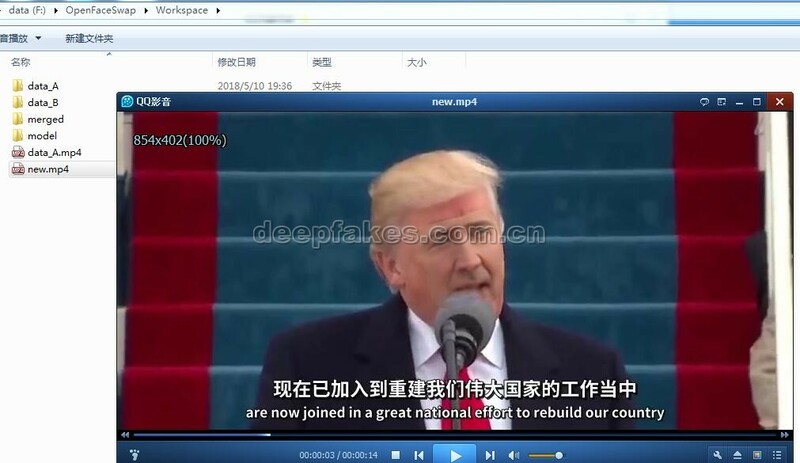 A B视频都是我自己找的 mp4 视频 , 请问这种情况怎么解决呢? \tensorflow_backend.py:1349: calling reduce_mean (from tensorflow.python.ops.math_ops) with keep_dims is deprecated and will be removed in a future version. 2019-03-21 08:04:11.381140: E T:\src\github\tensorflow\tensorflow\stream_executor\cuda\cuda_dnn.cc:396] Loaded runtime CuDNN library: 7402 (compatibility version 7400) but source was compiled with 7003 (compatibility version 7000). If using a binary install, upgrade your CuDNN library to match. If building from sources, make sure the library loaded at runtime matches a compatible version specified during compile configuration. WARNING:tensorflow:From E:\OpenFaceSwap\python\python-3.6.3.amd64\lib\site-packages\keras\backend\tensorflow_backend.py:1264: calling reduce_prod (from tensorflow.python.ops.math_ops) with keep_dims is deprecated and will be removed in a future version. WARNING:tensorflow:From E:\OpenFaceSwap\python\python-3.6.3.amd64\lib\site-packages\keras\backend\tensorflow_backend.py:1349: calling reduce_mean (from tensorflow.python.ops.math_ops) with keep_dims is deprecated and will be removed in a future version. D:\BaiduNetdiskDownload\AI_Change_face\OpenFaceSwap\python\python-3.6.3.amd64\lib\site-packages\h5py\__init__.py:36: FutureWarning: Conversion of the second argument of issubdtype from `float` to `np.floating` is deprecated. In future, it will be treated as `np.float64 == np.dtype(float).type`. D:\AI\OpenFaceSwap\python\python-3.6.3.amd64\lib\site-packages\h5py\__init__.py:36: FutureWarning: Conversion of the second argument of issubdtype from `float` to `np.floating` is deprecated. In future, it will be treated as `np.float64 == np.dtype(float).type`. WARNING:tensorflow:From D:\AI\OpenFaceSwap\python\python-3.6.3.amd64\lib\site-packages\keras\backend\tensorflow_backend.py:1264: calling reduce_prod (from tensorflow.python.ops.math_ops) with keep_dims is deprecated and will be removed in a future version. WARNING:tensorflow:From D:\AI\OpenFaceSwap\python\python-3.6.3.amd64\lib\site-packages\keras\backend\tensorflow_backend.py:1349: calling reduce_mean (from tensorflow.python.ops.math_ops) with keep_dims is deprecated and will be removed in a future version.